President Uhuru Kenyatta and DP Ruto heckled, booed and chased in Makueni and Mombasa. - Bana Kenya News, Real African Network Tubanane. Home News President Uhuru Kenyatta and DP Ruto heckled, booed and chased in Makueni and Mombasa. 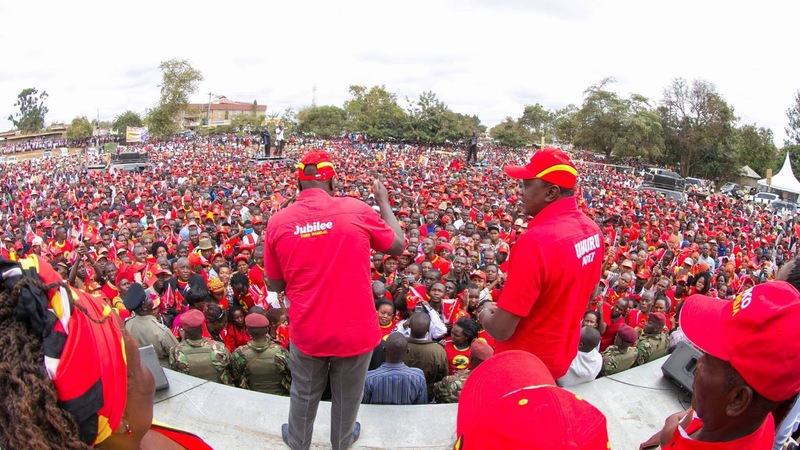 President Uhuru Kenyatta and DP Ruto heckled, booed and chased in Makueni and Mombasa. The president of Kenya Uhuru Kenyatta was heckled at Makueni when he visited Wote at Unoa grounds. The president warned the administration of Makueni to campaign for Jubilee because it's the Jubilee government they are working with. The President remained upbeat and promised the people of Makueni that the construction of Thwake Multi-Purpose Dam will commence this month and will cost around 62 Billion. Speaking to residents in Unoa Grounds in Wote Town, the President called upon the Kamba community to support his re-election bid for a second five-year term, exuding confidence in a Jubilee regime that he says has outdone its predecessors in terms of rolling development projects in the country. However, the Head of State faced some hard times when a section of residents in attendance started expressing displeasure by the regime by chanting the opposition National Super Alliance (NASA) slogans. The president was heading to Mombasa where he held a rally at Tononoka grounds accompanied by the CS Najib Balala and CS Dan Kazungu. The president is expected to attend another rally in Kilifi tomorrow.